The remains of at least 7,000 people may be buried beneath the University of Mississippi, officials estimate. The bodies of the state's first mental institution - called the Insane Asylum - stretch across 20 acres of campus where administrators want to build. Officials predict that it may cost up to $21m (£16m) to exhume and rebury each body - more than $3,000 for each. The campus medical centre, where the bodies have been discovered, is looking at cheaper alternatives. The university hopes to bring the total cost down by handling the exhumations in-house, the Clarion-Ledger newspaper reports. They predict that it can be done for $400,000 per year over the next eight years. They also hope to create a memorial and laboratory where students can study the patients' remains, as well as remnants of clothes and wood unearthed in the process. A group of academics have formed a consortium dedicated to studying the remains. "We have inherited these patients," said Ralph Didlake, who oversees the campus Center for Bioethics and Medical Humanities. Who are the 55 bodies buried at Florida school? "We want to show them care and respectful management," he told the Clarion-Ledger. "It would be a unique resource for Mississippi," Molly Zuckerman, a professor of anthropology, told the newspaper. "It would make Mississippi a national centre on historical records relating to health in the pre-modern period, particularly those being institutionalised." The Insane Asylum was completed in 1855 and operated until 1935. Before then, patients with mental illnesses were often kept chained in jails and attics of homes. According to records, of the 1,376 patients admitted between 1855 and 1877, more than one in five died. After the US Civil War the facility expanded dramatically, eventually housing about 6,000 patients during its peak. 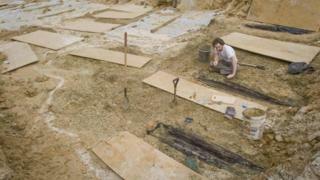 The first coffins were discovered by the university in 2013 while constructing a road near campus. In 2014 officials found more than 1,000 coffins while building a parking garage. Who are the 55 bodies buried at the Dozier school? Video Why have Tsar Nicholas' remains been exhumed?